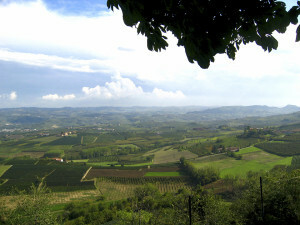 The vineyard landscapes of Langhe, Roero and Monferrato in Piemonte are now included in UNESCO’s World Heritage List, bringing the total number of Italian sites to 50. For those of us who live in this beautiful region of Italy, this news is long overdue. It really is a great achievement and victory for the many people who have worked hard over the years to give our region this international recognition. Indeed UNESCO brings a much awaited recognition to the generations of farmers who over time have contributed to shaping this area of outstanding natural beauty and an incentive with even greater responsibility to continue in the future. Some of the UNESCO sites include the DOCG Barolo and Barbaresco vineyards and the towns of Barolo, Castiglione Falletto,Grinzane Cavour,La Morra, Monforte d’Alba, Novello, Serralunga d’Alba, Barbaresco and Neive. Unesco recognition will bring substantial benefits to the area including at least a 30% increase in tourism over the first five years which in itself will have a positive impact on local business and economy in the area. Figures suggest that tourists arriving in the area will increase from 667,000 in 2011 to over 850,000 and generate more than 280 million euro. This entry was posted in News and tagged Langhe, Monferrato, Piedmont, Piemonte, Roero, UNESCO, World Heritage Sites on Friday June 27th, 2014 by Clive Wisbey. The weather is warming up nicely here in The Langhe region of Piemonte and Alba it’s capital is hosting a number of interesting events. Between 23rd April and May 1st we have the Vinum wine festival. Many great wines from The Langhe and Roero region are available to sample and buy such as Barolo, Barbaresco, Nebbiolo,Dolcetto, Arneis, Favorita, Chardonnay etc. The Alba Music festival takes place from 19th to 29th May shortly followed by the Alba Jazz Festival from 9th June to 11th June. The Alba International Film Festival is also happening between 2th and 5th of June. All these events take place every year and they are always superbly organized. This entry was posted in Leisure and tagged Alba, Alba International Film Festival, Alba Jazz Festival, Alba Music Festival, Roero, Vinum Wine Festival on Friday April 15th, 2011 by Clive Wisbey.